IMS Limited is a Japanese translation company that translates highly technical materials into modern Japanese. We translate Instruction manuals, user’s manuals, specifications, brochures, leaflets, contracts, legal agreements, annual reports, web pages, and many more types of documents. We provide professional translation of technical documents about machines, electronics, computers, and automation to support your business. Translations into a style of Japanese, that modern Japanese people can understand easily, are performed by Japanese staff who have a deep knowledge of the technical fields being written about. Ordinary readers will be able to understand our translations easily and immediately, since we offer real translations that contain colloquial ideas and phrases, easily integrated into the Japanese way of thinking. 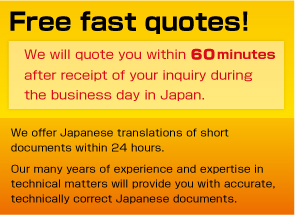 Speedy and accurate translations that satisfy the customers’ need for clear expression in Japanese. We accept PayPal, so that you can pay our bill instantly and at a lower cost to you than bank transfers. Provide the information requested in the boxes below and send it to us. We will quickly send you an E-mail with a formal quote. Items with an * (asterisk) are required. Click the [Confirm] button below after verifying that the details are correct.